Work Boot Insulators - Hard Sole. While in cold conditions feet usually suffer first. Simply slip these high efficiency Work Boot Insulators over boots or shoes providing feet with all the warmth they need, reducing the loss of productivity. Boot Insulators are lightweight with an approximate weight of 8 oz each. Now workers can wear lighter more comfortable boots or shoes and stay warm all day. Work Boot insulators are water resistant and collapsible for easy storage. Available in Black only with Hard Sole. 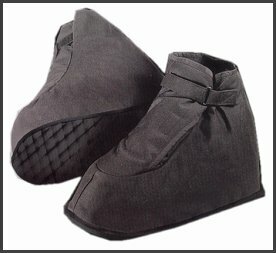 See hunting gear for soft sole boot insulators in black and camo fabrics.